The Chevron Midland campus, home of our Texas-based Mid-Continent business unit (MCBU), has achieved Leadership in Energy and Environmental Design (LEED) gold-level certification for meeting specific sustainability and energy efficiency standards in green building design. The Midland campus becomes Chevron’s 10th facility to receive this internationally recognized certification – underscoring our company’s commitment to protect people and the environment, including how we design our office facilities. "Our Midland campus is designed to help us develop energy in the Permian Basin in a way and at a scale we have never done before. And its LEED certification exemplifies the same commitment we bring to responsible development of our resources - by conserving fresh water, minimizing our environmental footprint and creating efficiencies in all we do." In designing a new Texas home for MCBU, the building architect, HOK, worked closely with the Chevron team to develop an effective workplace strategy with sustainability principles and goals for the project. They created an initial checklist at the start to help the entire team align around LEED, and the architect used rigorous design analysis and energy modeling throughout to monitor performance and drive design decisions. Chevron Midland received gold certification based on points granted in the areas of water efficiency, energy and atmosphere, material and resources, environmental quality, innovation and design, and sustainability. The Chevron Midland campus has achieved LEED certification for meeting sustainability and energy efficiency standards in building design. 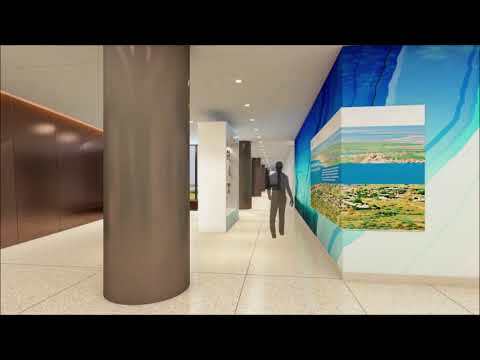 Get a virtual tour of the facility with this animation. In the category of water efficiency, the project’s noteworthy qualities include its design for a 100 percent reduction in the use of potable water for irrigation. In addition, the landscaping was designed with climate-tolerant, native, and adapted species of trees, shrubs, grasses, groundcovers, and perennials, along with the latest in irrigation control technology. The irrigation system was supplied with storm water catchment and storage containers within the site. Energy conservation efforts include efficient heating, ventilation and air-conditioning equipment, occupancy sensors, lighting controls, low-lighting power density through high-efficiency LEED lighting, and an underfloor air distribution system. All these attributes helped to create a building modeled to achieve energy cost reduction. During the first two years of operation, 70 percent of the building’s annual electrical needs will be offset through the purchase of renewable energy certificates. And more than 20 percent of building materials use recycled materials. More than 20 percent of the building materials were sourced from within 500 miles of the site, a quality which gained points toward LEED certification. The energy efficient building’s sustainability design strategy promotes bicycle commuting to the site rather than single-passenger auto travel by providing bike racks and access to showers and changing facilities for building occupants. The campus also encourages the use of high-efficiency alternative vehicles by offering 43 preferred parking spaces in a compact, efficient parking garage for low-emitting and fuel-efficient vehicles. In addition, the buildings were sited to minimize disturbance to the existing ecosystem and to preserve open space adjacent to the buildings. Storm water management is achieved through an on-site detention pool for mitigating the quantity of storm water run-off. Overflow from the pond is funneled through a storm water quality device to remove contaminants before being discharged from the basin. “LEED gold is a significant achievement and recognizes our commitment to environmental sustainability,” said Haregot.